Shelley Bean: Love and Stuff! I have missed all of you. Forgive me for being absent from my blog for so long. During the holidays I think I over did things and haven't been on track since then. After an email from a concerned and loving friend though, I am trying to repair my ways and get back in here and give my poor lonely blog some love. 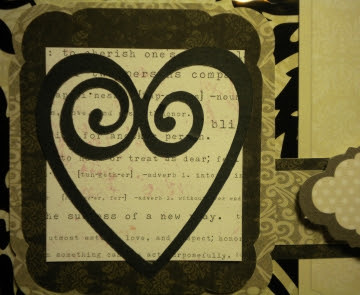 What better way than to create a "loving" card to get right in the mood! I was very fortunate to receive some awesome supplies provided by Anne at Paper Patch Crafts. 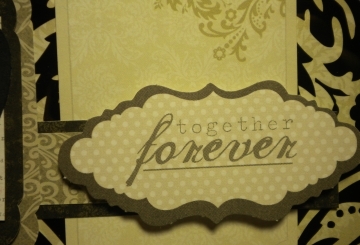 The products are made by Kaiser Craft from their Love Notes Collection. They are absolutely gorgeous papers too. Here is a card I made. It seriously went together so fast! There is a plastic overlay on top of the card and I added my own embellishment by cutting the heart with my Cricut using the Sweet Hearts Cart. 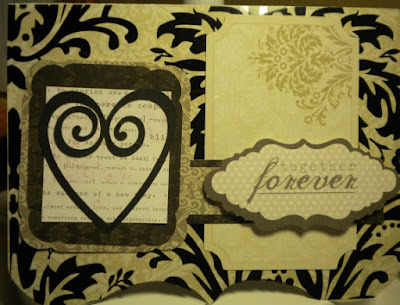 Please check out Anne's Store Paper Patch Crafts to buy these and other awesome cardmaking and scrapbooking supplies! Hello! I wanted to tell you that I have choosen you for a Stylish Blogger Award! I recently received one myself and as part of it you get to choose eight other blogs that you find stylish and pass the award along... if you go to my blog http://pammejo-scrapbookflair.blogspot.com/ you'll be able to get your award, then you can blog about it with a link back to my page. Make sure to tell eight things about yourself and list eight other "Stylish" blogs letting them know that they were chosen by you! Thank you so much for your creativity and inspiration. Congratulations!